Q. Congratulations for your victory, first of all. How did you feel? How are the feelings here? How are you recovering yourself? RAFAEL NADAL: Well, I'm recovering. These days we do whatever we can, you know. That's an important victory today. Each match in this kind of tournament is very demanding from the first round. Today I played only ‑‑ with the best players in the world, you know, each victory is important. It means a lot, so I'm happy for being able to make it to the next round. We have to be realistic, you know. Winning a match here means you go to Round of 16 where we have the 16 best players, so I'm quite happy. All the matches are very different. I'm happy about the feelings I have here. I have positive vibes. He was a very uncomfortable rival. You know, he makes you play quite badly. He doesn't give you the rhythm. You don't have rhythm. Well, you're in a bad situation every single moment. He has one of the best backhands in the circuit, without any doubts. With the serve and the altitude he got a little bit of help, so it's difficult to scratch some points from your opponent. He managed to get a lot of points with his serve. There was a complicated moment at 3‑2 in the second set where he had a break point. Miraculously, I saved it. Q. Rafa, now you are talking about two points, a miracle, one in each set. Maybe that was the key of the match. The match was an hour and a quarter. Did you hope you would play longer given the opponent? RAFAEL NADAL: Well, no. The question did you hope? Well, I cannot tell you what I was hoping. I'm just going out there to the court to do whatever I can. Then if it lasts one hour 50, two hours, or three hours, whatever, I don't know. I try to go point by point. I try to do my best and try to do everything I can and get as many points as possible. I try to win. Then it's true that Paire is a player that doesn't make you play pretty long rallies. He just cuts the rhythm in all the points. He's a player who's physically demanding and you don't know where he's going to move you. He gives you some shots you're not expecting on many occasions. He's very physically demanding. You have to make a lot sprints; you have to change direction a lot, really fast movements. Q. In Monte‑Carlo you were saying that sometimes you have the feeling that to win is a tie, because in this year you have to defend your titles. Coming to this tournament where you can win some points, do you play with a different mentality here? RAFAEL NADAL: Well, no, no, nothing is really changing here. Everything that I said‑‑ in the past sometimes I had the feeling that the expectation is too high. I ask myself too much. Completely different matter this year. I come from a year that I haven't been playing and I've been injured. The victories each mean a lot for me. I really don't have the feeling that if I win I tie. Sincerely, to defend or not to defend doesn't change anything. The goal is always the same, you know. I always measure the race of the whole year. I don't measure what I defend and what I don't defend. It's a guide. I know how I'm going doing in the year. Well, all the other things, I've never looked at them. I'm not going to look at them this year. I've had seven months without any points, seven months without a points in the rankings. The only thing I can look at for my motivation is the race of the year. To me it doesn't change anything to defend or not to defend. Each week I see it as a new opportunity. That's the way I face every single tournament. Q. You always go match after match. Do you think three of the possible winners of the tournament, like Nico Almagro and Ferrer and Federer are possible rivals in order to make it to the final? Do you think about that? 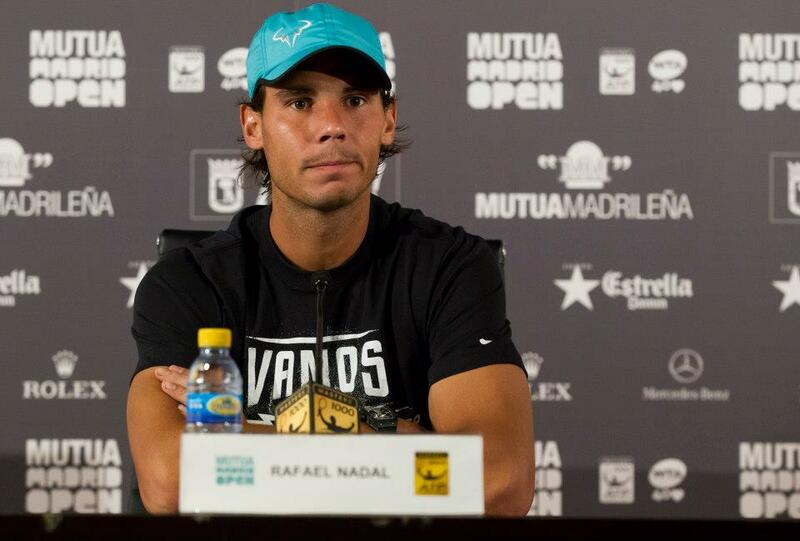 RAFAEL NADAL: I really think about the next match. Could be Almagro or Youzhny. They are good players. They both play at a really good level. Almagro is playing really well. He just came back from making it to the final in Barcelona, and here in Madrid he has a very powerful serve and really good shots. Maybe he benefits a little bit more here in Madrid. So over there when the big matches come, it would be arrogant to think furthermore, because I just don't consider that. Well, in the situation that we are at this level of the tournament, I think that in this case‑‑ well, all of us, we're just going match after match. All of us are thinking that way. That's the only way you can do it in this kind of tournament with this level. Q. You've talked already twice about the altitude and the serves. In a tournament like this, do you work more on your serve or on your return? Are you happy today with your serve? RAFAEL NADAL: I work as in any other tournament. Doesn't change anything. Well, you know, in tournaments of this characteristic, it's very important to be sure about your serve, to feel that you keep winning the points with your serve. Yeah, I'm happy about it. I never lost the serve in any point of the match. I had some complicated points and I managed to win some points. I made some aces. Well, I don't know the exact percentage, but I have the feeling that it was pretty high. So, no, no, I cannot be unhappy. About the rest, it is important to return longer than what I've done today. Today with the player I had I was feeling a little bit uncomfortable. I didn't know where to return. I wasn't returning the balls with so much precision. For the match of tomorrow I have to return the balls much harder. I have to try to make the ball fly better. That's the thing I have to do to do well tomorrow. Q. You said that you play with less anxiety after the injury. Do you feel more pressure when you play tournaments like this one in Madrid? RAFAEL NADAL: My only anxiety is to be well physically talking. I don't know if I'm more anxious and nothing else about that after what has happened to me. I haven't forgotten it, of course. It's complicated, because I've had really good results over here and I don't feel really comfortable with my knee. But to be honest, I'm not feeling really comfortable with my knee. It's not forgotten, of course. I haven't forgotten it. It's the only thing that I have in my mind that creates some doubts. About the rest, I'm repeating it: The results are much better than what I have ever dreamed. Maybe what could have caused me some anxiety, talking about results, is to see that in the ranking I have gone really down. If I hadn't had really good results in all of the tournament that I have to defend, like, for example, Monte‑Carlo or Indian Wells or Miami or Roma next week, and Roland Garros, that I could maybe go down to 25 or 30 of the world. That could perhaps create some anxiety in me. You know, luckily I've been playing six tournaments and I've done really well. Talking about the results being good, not at all. I'm going to take this year as a year of transition, and I will try to be as good as possible. My only anxiety and doubt is that the knee gets better day after day. Q. I wanted to ask you about the defeat of Djokovic yesterday. Were you surprised about it? What did you think about the attitude of the crowd with him? What did you think about Dimitrov? RAFAEL NADAL: You know, he won a set from me in Monte‑Carlo. In Miami he served for the set against Djokovic; in Monte‑Carlo he won a set from me. When you see a player coming and doing really well, really high level, one of these days he will have to fly, you know. He's a player that doesn't have a single reason not to do really good. He has everything he needs to be a really good player. It doesn't make any sense that's he's not even more up there. In fact, he's 22 years old, I think. I thought that he was going to be up there this time last year. When I saw him playing for the first time I already thought that. Maybe before when I played with him in Rotterdam in 2009. So it surprises me the jump in quality that he was supposed to make, he should have done it three or four years before I thought. But I think he's doing it right now. We will see that he's going to be up there in the short term with the best of the world. He already is, but we'll see that he's going to be up there. Talking about the Djokovic defeat, those things can happen. When you're playing this kind of tournaments you've got the best players in the world. You're asking of yourself the most since the beginning, the first rounds. Well, it happened. He was defeated. And the attitude of the crowd I cannot assess, because in the hotel I didn't have the channel. I didn't see the match. Sorry. Q. Rafa, in the first press conference that you gave here in the tournament you didn't expect a lot of differences between your game in respect to the games in Monte‑Carlo and Barcelona. After that match do you still have that feeling? RAFAEL NADAL: Well, I told you I was going to go day after day. I think I remember‑‑ sometimes I don't remember everything I say. I say so many things I can't remember. I said the results have been really good, but I had the feelings I could play better than what I was doing until now. Sincerely, today was a really difficult match to assess, a very difficult match to think about. I think I started playing at a really high level, which is really important. I started playing comfortable. Afterwards the match got dirty. Whatever I wanted to do, whatever I tried to ‑‑ you cannot play with rhythm because he didn't let me play with rhythm. But it's true that I have been playing three or four days training better than what I have been training before in Barcelona or Monte‑Carlo. Talking about tennis, I'm happy about how everything is going and about how my week is going in Madrid, especially talking about my training. When you go on the courts, one day you can play badly and lose. Me personally, I feel really comfortable and happy about how I have been working this week. I am more happy about the way I have been playing this week. Talking about training, all the hard work that I have put in in Monte‑Carlo and Barcelona doesn't guarantee you anything. Only guarantee you have is that you go each day home happier because of how I have played. Q. Just an assessment of your performance today, please. RAFAEL NADAL: Yes, thank you very much. I think I played a solid match against a very difficult and uncomfortable opponent to play against. I think his style of game is very difficult for everybody, and it's very difficult to get the rhythm, to be in rhythm in the match against him. I tried from the beginning. I think I started the match playing well, having some solid points, hitting a good forehand. I am feeling well the ball with my forehand, especially and with my serve. But even if I tried from the beginning, in the second set I was in a problem with the break point in the 3‑2, no? Here the conditions are fast, even if this is the best year for sure. If we talk about the conditions on court, the court is much better than any year in this tournament. So that makes the tournament, even if we are in altitude, a little bit more equal to the other tournaments on clay. So I am happy about my performance. I am happy that I'm through and tomorrow I have another opportunity. Q. We had a piece of football news in England today from Manchester. What's you're view on that? RAFAEL NADAL: Well, just the only think I can say is congratulations to Sir Alex for his amazing career, all the titles that he made. Probably he changed the history of my youth. So just congratulations and wish him all the best for the rest. I think after this fantastic and long career, now he deserve to be a little bit more with calm and enjoy his other life. Q. What are your thoughts on the crowd today? When Paire was hitting winners they started booing him. Yesterday was the same with Djokovic. RAFAEL NADAL: Can you repeat, please? Q. Paire today, against Paire today. RAFAEL NADAL: I am answering. I am not agree with you. Sorry. The crowd today was 100% correct. That's my opinion. The crowd didn't say nothing against Paire. I am from Spain, and it's normal the crowd want to support me. It happens to me the same when I play in different countries against a local player. That's the good part of the show. In the end, this is only a game, no? It's nice to have the crowd involved in this show. Nothing against the crowd. I think the crowd here is very emotional. That's all. I think they respect the players always, and I repeat that I cannot have a real opinion on yesterday's match because I didn't see it.